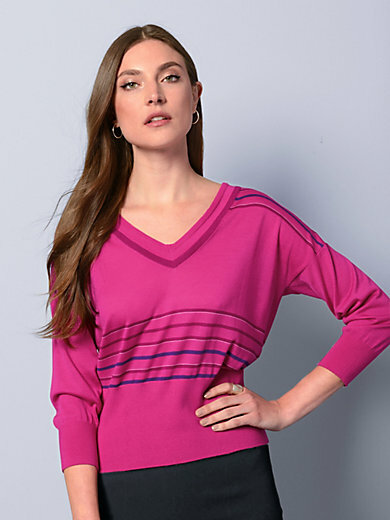 V-neck jumper by STRENESSE with 3/4-length sleeves and a deep neckline. Fashionable knitwear made of exquisite natural yarn, for people who value quality! Very attractive in bright pink with striped parts on front and back. Modern style with extended shoulders and rib knit cuffs and hem. In 90% new milled wool, 10% cashmere. Length approx. 23ins. The jumper should be washed by hand.